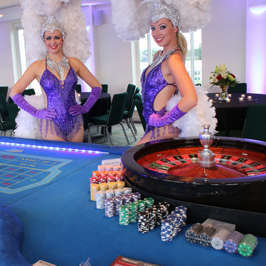 Diamond Fun Casino Hire can provide the ideal entertainment for your next fun casino themed party. In addition to the gaming tables any casino party idea will enhance your casino themed party – how about starting it off with a party invitation in the shape of a playing card detailing when and where the fun casino party will be held. The style of the fun casino party theme can be anything you can imagine – a Viva Vegas night, a Rat Pack casino party, a casino party poker event or 007 casino party game night. Add to the fun by getting your guests to dress the part for a stars of the silver screen casino night party theme, ladies will love a Gone With The Wind casino party or even a roaring twenties casino party. 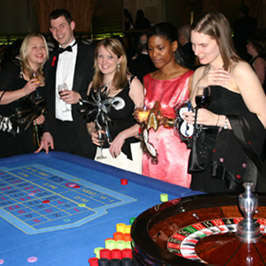 A black tie event will suit many fun casino events, give your guests the excuse to get their glad rags out! For fun casino parties that fall at a certain time of year we can theme our croupiers to your event be it Halloween, Christmas, Beach, Hawaiian or Safari. Our play for fun casino will be set up prior to guests arrival and the croupiers will be ready to provide first class entertainment on our luxurious full-size gaming tables. Don’t worry about access into smaller venues or even your own home as our tables can be dismantled for ease of access and then put together securely once in position. For your casino party decorations think jumbo playing cards, sparkling door curtains, black and white or inflatable playing card balloon decor, fun casino themed birthday party confetti sprinkled over black tablecloths, casino decoration for the tables. Ask us about acts and casino party supply that may compliment your event. We can supply subject to availability, Bond lookalikes and dancing girls, magicians, Elvis impersonators, Rat Pack singers, rodeo bull, inflatables and simulators, giant Scalextric, chocolate fountains and professional photographers. For your 007 casino theme party guests can be asked to dress the part of their favourite Bond character, serve that famous shaken not stirred martini as an aperitif, then guests can play their Bond role on the casino tables. We can provide party decoration for your 007 fun casino party including silhouette girls, 8 ft illuminated backgrounds to full size James Bond colour cut outs, framed pictures and banners. For your Hollywood night casino party rental how about a red carpet rolling up to your front door, a couple of beefy security guards in dark glasses standing either side of the entrance, a flash of cameras as guests alight from their vehicles! A Las Vegas casino party would be complimented by our 8ft high favourite Vegas hotel signs and background music played by the regulars at Las Vegas. Your casino birthday party can be themed about you! (Or as a surprise if the fun casino party is for someone else). How about if we put your image onto a fun casino note with the denomination of that note being the same as the birthday boy or girls age. For example, we can provide a £50 fun money note featuring the birthday person with the text ‘Bank of xxxx’. Wind up the more mature birthday person by making it groats instead! 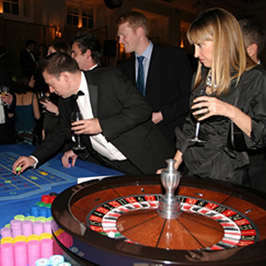 Whatever your casino theme party idea may be, the excitement of the gaming tables will no doubt be the highlight of the casino party, guests young and old will delight in trying their hand at our games such as Blackjack, Roulette, Poker and Craps for fun. Please note, many theme accessories are included with your fun casino hire subject to availability and at no extra cost to your event. You are more than welcome to provide your own, for example, if you would like to design your own fun money then we are happy for you to do so and would welcome it as legal currency on our gaming tables! We will advise you on the number of notes required to tie in with our table denominations according to number of tables booked and number of guests at the fun casino party. All it takes is a phone call ….